Life is full of great debates: vanilla vs. chocolate, coffee vs. tea, pancakes vs. waffles, dogs vs. cats—you get the idea. As for computer users, one of the greatest debates that’s been raging since the mid-1980s is which PC platform is best, Mac or Windows. While both sides in all the aforementioned debates are usually equally as passionate as the other, the answer always comes down to individual preference. So, no matter what side you’re on, you win. You get to choose what is best for you, no matter the reason for that choice. For CAD users, however, the answer has not been as cut and dry as choosing based on personal preference. Why? Not every CAD program is available on both Mac and Windows platforms. This means you either stick with your platform of choice, which limits your software choice, or be forced to pick a platform you may not be familiar with to use the software of your choice. That’s not a win/win. For Mac and AutoCAD users, the world just got a lot bigger in terms of choices. Earlier this week, Autodesk announced the launch of AutoCAD 2017 for Mac and AutoCAD LT 2017 for Mac. 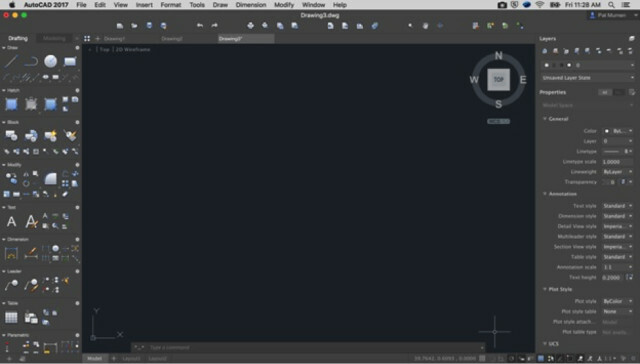 It’s been over a year since the PC version of AutoCAD was ported to the Mac, and the Autodesk team has made many improvements and enhancements for the Mac platform. Mac users desiring AutoCAD as their CAD software choice can now work with familiar hardware, software and workflows. That’s a big deal when you consider there are 170-plus million users of Autodesk applications worldwide and, according to Credit Suisse, 588 million Apple users worldwide. Albeit the Apple users aren’t all using PCs and the Autodesk users aren’t all using AutoCAD, you can see we’re still talking about very big numbers. Will it be enough to tip the market share in Autodesk’s favor or is it too little too late? In comparison, Nemetschek’s CAD software, Vectorworks, has been available to Mac users since it was released as MiniCad 1 back in 1985. Now in all fairness, it took 11 years before Nemetschek’s CAD software was available to Windows users in the form of the 1996 release of MiniCAD 6—although that is much more reactive than the 30-plus years it has taken Autodesk to extend its usability across platforms. I think it’s way too early to predict how this might affect the overall market share within the industry, but it will change the playing field quite rapidly. Autodesk has a big job ahead of it in winning the hearts and minds of Mac users. There have been plenty of successful companies that have provided great CAD solutions on the Mac platform over the years and listened to the needs and wants of those Mac users. Autodesk is going to have to be more receptive to user feedback and industry trends to gain advantage. In looking at some of the improvements it has made in regards to giving Mac users a familiar user interface and improved functionality, Autodesk is showing it is heading in the right direction.